Health food for the masses! Somewhere, tucked away in the season of good eatings, there must be a way to sneak some sensible food into the mounds of fat-filled, calorie-laden foods that we crave. As this year ends and another begins, the Holiday season can overwhelm us with invitations to potluck buffets, not to mention the entire family descending upon your tiny kitchen for consecutive, Sumo-sized feedings. What’s quick, simple to prepare and a solution to practically all dietary needs? The answer is Quinoa (pronounced keen-wa) that is enjoying acclaim from the foodies, yet making inroads into every day life. This is a grain that may well become a regular lodger in your pantry, once you’ve discovered the ease of preparation, versatility and high yield of the product. Although only recently introduced to mainstream America, Quinoa dates back to the Incas, who grew the grain high up in the Andes of South America. They respectfully referred to it as the Mother Grain as it was one of the staples in their diet, along with corn and potatoes. It is a hardy plant, growing in less than perfect conditions, yet produces a prolific crop. Is it any small wonder that high-altitude Colorado is the site for quinoa fields now? 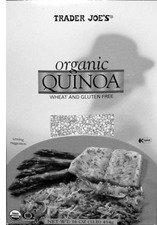 Quinoa is light, tasty and easy to digest. Not only is it wheat and gluten-free, but tops the charts as a rich and balanced source of nutrients. The National Academy of Science calls it “one of the best sources of protein in the vegetable kingdom” as it contains more high quality protein than any other grain. It also features some of those elusive amino acids, making this a complete protein, so very important for overall good health. It blasts rice right out of the race and gives wheat a good run for its money. The absence of cholesterol and sodium also add to its winning qualities. Assuming that there are picky eaters in your household, introducing something new can send them into stubborn refusals. Before you sink into an anxiety-ridden quicksand, slyly consider that you can blend Quinoa into existing family dishes without them noticing it. It can be served as a substitute for rice, blended into soups, mounded into salads or pilafs, stuffed into peppers, or packed into casseroles. Pale yellow in color, it offers no color controversy and cooks to a light, fluffy texture with a hint of a crunch on the stovetop, microwave (ready in 7 minutes!) or even a rice cooker. Available at Trader Joe at the modest price of $1.99 for a 16oz box. A tasty recipe is on the back.